Leadville is a statutory city that is the county seat of, and the only municipality in, Lake County, Colorado, United States. Situated at an elevation of 10,152 feet (3,094 m), Leadville is the highest incorporated city and the second highest incorporated municipality in the United States. A former silver mining town that lies near the headwaters of the Arkansas River in the heart of the Rocky Mountains, the city includes the Leadville Historic District, which preserves many historic structures and sites from Leadville's dynamic mining era. 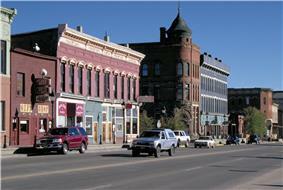 In the late 19th century, Leadville was the second most populous city in Colorado, after Denver. The United States Census Bureau reported an official count of 2,602 inhabitants in the 2010 census. The history of Leadville begins during the Pikes Peak Gold Rush when placer gold was discovered in California Gulch in 1859. By 1860, the town of Oro City sprung up near present-day Leadville and by 1861 the population had soared to over 5,000. Horace Tabor, who was to become known as the "Leadville Silver King" and his wife Augusta were some of the first prospectors to arrive; Horace tried his luck at prospecting, while Augusta worked as a camp cook, laundress, banker and postmistress. But the boom was brief and Oro City never became a major settlement. The placer gold mining was hampered by heavy black sand in the sluice boxes. 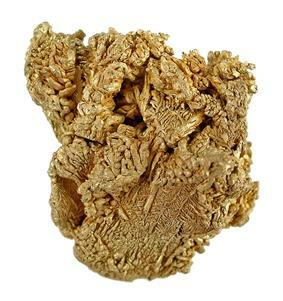 In 1874, gold miners at Oro City discovered that the heavy sand that impeded their gold recovery was the lead mineral cerussite, carrying a high content of silver. Prospectors traced the cerussite to its source, and by 1876, discovered several lode silver-lead deposits. The city of Leadville was founded near to the new silver deposits in 1877 by mine owners Horace Austin Warner Tabor and August Meyer, setting off the Colorado Silver Boom. 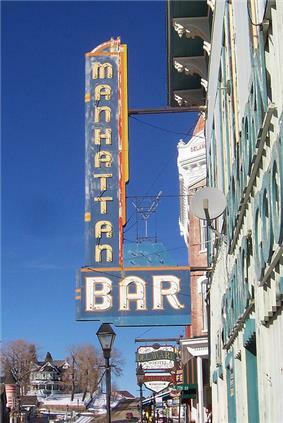 First they called the city "Slabtown," but soon when it started becoming wealthy they changed the name to "Leadville." By 1880, Leadville was one of the world's largest, and richest silver camps, with a population of over 14,000. One of the first persons to offer entertainment in Leadville was William Nye; he opened the first salon early 1877 and was followed by many others. The same year "The Coliseum Novelty" was the first theater to open. It offered sleeping rooms upstairs for a nightly rate. The Coliseum had a variety of shows: dancing girls, dogfight, cockfight, wrestling, and boxing matches, as well as gaming rooms for gambling. On June of 1881, after a second fire, this lively spot burned to the ground. Ben Wood came to Leadville in 1878 and opened the first legitimate theater. 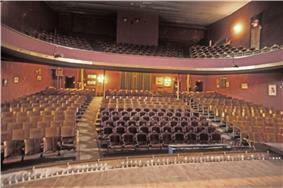 Known as "Wood's Opera House," it had one thousand seats. Wood's Opera House was a first- class theater, where gentleman removed their hats and did not smoke or drink in the presence of a lady, to show the decorum required in a high-class theater. Wood's Opera House was regarded as the largest and best theater ever constructed in the west, an honor that was held until the opening of the Tabor Opera House. Less than a year later, Wood also opened "Windsor Hotel" next door. The Tabor Opera House was built in 1879 by Horace Austin Warner Tabor (HAW Tabor). This was the most costly structure in Colorado history; the materials to build it were brought up by wagons from Denver. This massive three-story opera house, constructed of stone, brick, and iron, opened on November, 20th, 1879. Horace Tabor, originally from Vermont, settled in Leadville and became the town's first Mayor. After striking it rich in the town, he had an estimated net worth of 10 million dollars and was known for his extravagant lifestyle. Leadville's banking sector was always somewhat shaky. Lake County Bank, established in 1878, was the first to open. Initially successful, it received a federal charter, was capitalized at $60,000 and renamed "First National Bank". 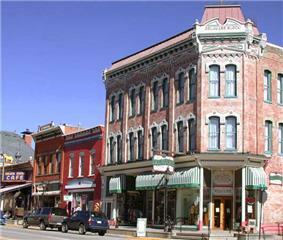 Despite its big deposit base, it went bankrupt in 1883, leaving the town without a bank until 1884. Father Robinson was the first parish priest in Leadville. After erecting the first Catholic church in town, the Church of the Annunciation on the corner of Seventh and Popular Street, he and the Sisters of Charity also raised funds to build St. Vincent's Hospital. The town had various newspapers, with the first, "The Reville", a Republican weekly, appearing in 1878. Three months later, a competing Democratic weekly, "The Eclipse", emerged. The Chronicle was the town's first daily, as well as being the first newspaper in America to employ a full-time female reporter. Like the Rocky Mountain News, The Chronicle took the lead in outing criminals and thieves, in an attempt to clean up the town's shady business culture. Despite the many violent threats, the Chronicle survived without any major incident. The first post office was in Tabor's store at Oro, with Mrs. Tabor acting as postmistress. Carriers went down to Denver one week and tried to come back the next, and postage was fifty cents a letter. In early 1878, Meyer, Harrison, Tabor established a post office in Leadville, with Henderson as postmaster. The post office prospered, and the telegraph office also did a tremendous business. The smelting history of Leadville is remarkable. No mining camp in the world was ever in so short a period provided with as many extensive smelting works. In 1882, the Tabor Opera House hosted Oscar Wilde during his lecture tour, one of many celebrities who graced the city. Mayor David H. Dougan invited Wilde to tour the Matchless silver mine and open their new lode: "The Oscar". Wilde later recounted a visit to a local saloon, "where I saw the only rational method of art criticism I have ever come across. Over the piano was printed a notice – 'Please do not shoot the pianist. He is doing his best.'" Confederate scout, cowboy and stage actor with "Buffalo Bill" Cody's travelling revue, Texas Jack Omohundro died in Leadville in the summer of 1880, of pneumonia, one month before his 34th birthday. He was living there on a small estate with his wife, ballerina Giuseppina Morlacchi. It was during this period that Leadville saw its most dangerous days, finally brought under control by little-known American Old West lawman Mart Duggan. Around 1883, outlaw Doc Holliday moved to Leadville, shortly after the gun fight at the O.K. Corral. On August 19, 1884, Holliday shot ex-Leadville policeman, Billy Allen, after Allen threatened Holliday for failing to pay a $5 debt. Despite overwhelming evidence implicating him, a jury found Holliday not guilty of the shooting or attempted murder. In its early years, Leadville was the site of famous mining swindles. When the Little Pittsburg mine exhausted its rich ore body, the managers sold their shares while concealing the actual condition of the mine from other stockholders. "Chicken Bill" Lovell dumped a wheelbarrow of rich silver ore into a barren pit on his Chrysolite mining claim in order to sell the claim to Horace Tabor for a large price. Tabor had the last laugh when his miners dug a few feet farther and discovered a rich ore body. Later, the manager of the Chrysolite mine fooled an outside mining engineer into overestimating the ore reserves of that mine. A bitter strike of hard rock miners in 1896–97 led to bloodshed, at least five deaths, and the burning of the Coronado Mine. The city's fortunes declined with the repeal of the Sherman Silver Purchase Act in 1893, although afterwards there was another small gold boom. Mining companies came to rely increasingly on income from the lead and zinc. The district is credited with producing over 2.9 million troy ounces of gold, 240 million troy ounces of silver, 1 million short tons of lead, 785 thousand short tons of zinc, and 53 thousand short tons of copper. During World War II, Leadville was a popular spot for visits by soldiers at nearby Camp Hale, but only after the town acted to curb prostitution; until then, the United States Army declared the town off-limits for its personnel. 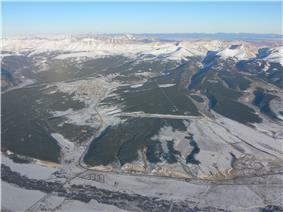 The Army Air Forces built the Leadville Army Airfield northwest of the city. The war also caused an increase in the demand for molybdenum, used to harden steel and mined at the nearby Climax mine, which at one time produced 75 percent of the world's molybdenum. Climax molybdenum production began during World War II and by 1980 it was the largest underground mine in the world. The taxes paid by the mine provided Leadville with good schools, libraries, etc., and provided employment for many of Leadville's residents. When the market dropped in 1981, Leadville's economy suffered and many people lost their jobs. With little industry other than the tourist trade, most of the former miners left and the standard of living declined. Climax reopened again in 2008 and started its production in 2010. It currently is the most efficient mine producing the metal in Colorado. They estimate to have a production life of thirty years. 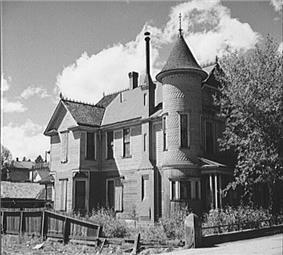 The Leadville Historic District was designated a Temple Israel, Annunciation Church, Tabor Opera House, City Hall, Healy House, Dexter Cabin, Engelbach House, and Tabor House, as well as mining structures and small homes. Structures built after 1917 are considered non-contributing. The closing of the Climax mine in the 1980s was a major blow to the town's economy. In addition, the many years of mining left behind substantial contamination of the soil and water, so that the Environmental Protection Agency designated some former mining sites in Leadville as Superfund sites. The town is now 98% cleaned up and the Superfund designation is about to expire. The town has made major efforts to improve its economy by encouraging tourism and emphasizing its history and opportunities for outdoor recreation. The National Mining Museum and Hall of Fame opened in 1987 with a federal charter. The town's altitude and rugged terrain contributes to a number of challenging racing events, such as the Leadville Trail 100 series of races. It is often used as a base for altitude training and hosts a number of other events for runners and mountain bicyclists. Leadville is known for its festive atmosphere. Boom Days, held on the first full weekend of August, is a tribute to the city's mining past. The festivities include mining competitions and burro racing. Crystal Carnival, held late in winter, features a skijoring competition on Harrison Avenue. Additionally, Leadville has frequent, though sometimes small parades held in the downtown area, such as the quirky "St. Patrick's Day Practice Parade". 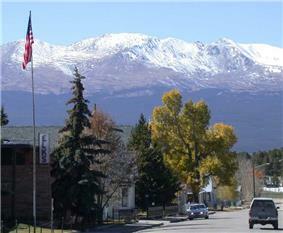 Leadville is the highest incorporated city in the United States. Higher towns and unincorporated settlements do exist. See Extreme points of the United States. At an elevation of 9,927 feet (3,026 m) the Leadville Airport (Lake County Airport, KLXV) is the highest airport in the United States. At 9,680 feet (2,950 m), the Mount Massive Golf Course is the highest golf course in the United States. 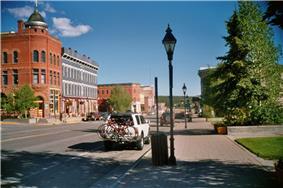 Leadville has an alpine subarctic climate with cold winters and mild summers, bordering on a cold semi-arid climate. The average January temperatures are a maximum of 31.1 °F (−0.5 °C) and a minimum of 3.1 °F (−16.1 °C). The average July temperatures are a maximum of 72.2 °F (22.3 °C) and a minimum of 37.8 °F (3.2 °C). There are an average of 278 days annually with freezing temperatures, which can occur in any month of the year. The record high temperature was 86 °F (30 °C) on June 23, 1954. The record low temperature was −38 °F (−39 °C) on February 21, 1995. Average annual precipitation is 12.19 inches (310 mm). The wettest year was 1957 with 22.14 inches (562 mm) and the driest year was 1994 with 8.81 inches (224 mm). The most precipitation in one month was 4.83 inches (123 mm) in January 1996. The most precipitation in 24 hours was 2.10 inches (53 mm) on December 24, 1983. Average annual snowfall is 142.7 inches (3.62 m). The most snowfall in one year was 247.9 inches (6.30 m) in 1996. The most snowfall in one month was 63.2 inches (1.61 m) in February 1995. In the city the population was spread out with 22.1% under the age of 18, 12.1% from 18 to 24, 34.4% from 25 to 44, 22.0% from 45 to 64, and 10.4% who were 65 years of age or older. The median age was 34 years. For every 100 females there were 109.1 males. For every 100 females age 18 and over, there were 107.8 males. The Leadville Trail 100, an ultramarathon, takes place in and around Leadville. Leadville hosts an annual Skijoring event and a Crystal Carnival in March. This is a horse-drawn skiing for the family since the 1960s. Leadville's Annual Boom Days, which takes place the first full weekend in August, has been honored by the United States Congress as a Local Legacy Event. This three-day celebration of the area's mining heritage offers entertainment for people of all ages and interests, from mining competitions, motorcycle games and a rod and gun show, to live music, a craft fair and parade. The 21-mile Leadville Boom Days International Pack Burro Race — the second leg of Pack Burro Racing's Triple Crown — is always a crowd favorite. Alice Ivers Tubbs, frontier gambler known as "Poker Alice"
Plague Year, a bestselling 2007 novel by Jeff Carlson. In this novel, Leadville is the new U.S. capital with a population of 650,000 refugees. ^ "Leadville - Cloud City USA". Retrieved 27 July 2014. ^ William Philpott, The Lessons of Leadville, Colorado Historical Society, 1995, pages 3–4. ^ Voynick, Steve (June 2006). "Restarting Climax: The who, when, and why". Retrieved 26 July 2014. "Leadville Lifestyle – Community Portal"